Holi - the Hindu festival of colors is round the corner. It is one of the most enjoyable Hindu festival. This vibrant festival is celebrated in the most enthusiastic way by the people of all age groups. However the fun of playing Holi will be lost when the harmful chemical colors used in the festival cause skin and hair problems. In the ancient times, people used to use natural colors during the festival which was harmless to the individual and to the environment as well. But in the recent past people are much used to the use of synthetic colors which contain chemicals that are harmful both to the individual and the environment. The chemical / synthetic colors used also pose a threat to the environment. Many awareness campaigns are encouraging the use of natural colors, yet synthetic colors are being used in Holi festival. Before going to play Holi apply herbal oil on your face and exposed skin like neck, hands and palms. You can also use coconut oil or almond oil which is effective in protecting your skin from synthetic colors. Apply sunscreen / organic moisturizer on the face, hands and legs to protect your skin from the harmful UV rays of Sun. Do not expose much to the sunlight but try to stay in shade while playing with colors. The harmful chemicals get absorbed by the skin when it is exposed to the sunlight and harms the skin. Applying sunscreen acts as barrier and protects the skin from damage. Do not oil your hair. Oily hair gets sticky and the colors readily stick on oily hair. 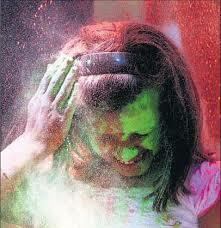 Either keep you hair open or tie a pony tail or plait it and wear a head cap when you go out for playing Holi. Do not tie a top knot as colors get accumulated in the knotted hair. Apply either two coats of nail polish to the nails or apply mehendi in a traditional way. The color on the nails protect them from getting discolored. Wear swimming glasses / sunglasses to protect your eyes and the skin around you eyes. If possible wear a mask to cover you nose and mouth so that the chemical colors do not go into your mouth / nose. On getting back home after playing immediately wash off the colors with lukewarm water and then go for a shower to clean up / remove the remaining colors (dry / wet colors) from the skin and hair. Do not remain for long hours with the colors on your skin as dried up colors cling fast on the skin and could result in the clogging of pores, thus causing harm to your skin. While having shower clean your facial skin, hands and legs first with lukewarm water to remove the colors and then clean with natural cleansers like gram flour paste, sandalwood paste, yogurt without cream or aroma oil, aloe vera extract. Use of an organic / herbal face wash or scrub would serve the purpose. Do not rub the skin hard to remove the colors as this might damage the skin. Wash / clean your hair with mild organic / herbal shampoo or hibiscus paste as this retains the softnesss and luster of hair. After you are fully done with your cleaning have a traditional refreshing drink to stay cool.